Photo credit: New York Times. Trubisky was terrible. There’s no reason to sugarcoat it. Young quarterbacks are going to have games like this and all you can do is hope they grow from it. Mitch looked antsy in the pocket, was sailing balls to wide open receivers and made 2-3 decisions you simply can’t make. (The pick at the end of the first half was inexcusable.) Jared Goff was worse. And that’s why the Bears won. Kyle Fuller’s interception late third quarter was the most important play of the game. Fuller’s had a brilliant season but it was clear in that moment this Bears defense wasn’t going to be defeated. Fuller shouldn’t just be going to be the Pro Bowl this season. He should be named an All Pro corner. He’s been the best in the NFL. Eddie Goldman registering a sack/safety made me incredibly happy. Goldman is the unsung hero of this defense; the most important component of the league’s second-best rush unit. (New Orleans is quietly great against the run.) He deserves to fill the stat column every once in a while. Aaron Donald did nothing. Who gets the credit? Everybody. But it starts with James Daniels. Injuries may be the story that lingers from Sunday night. Bryce Callahan’s looked the most serious. Leonard Floyd delivered his most complete performance in years but couldn’t finish it. Bears need both of these guys down the stretch. Pat O’Donnell had the best game of his Bears tenure. 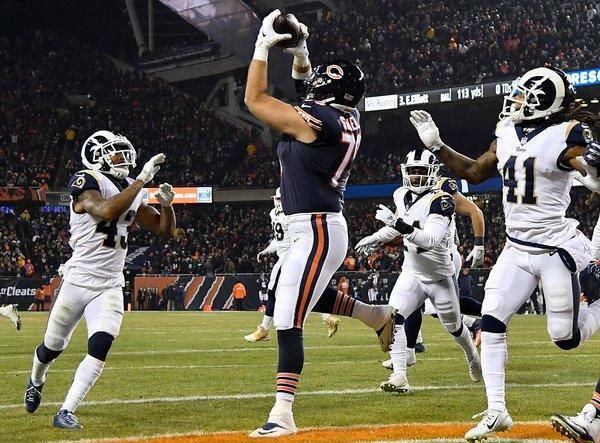 On a night where the Bears needed him to be great, he was. Cody Parkey isn’t going anywhere in 2018. But he better have competition next summer. The fans were incredible. Never heard the stadium louder on television. Chicago has embraced this team. Why wouldn’t they? Matt Nagy is coach of the year. It’s over. Send the award to wherever he lives. Right now. Do it. And send a copy of the award to Bradley Sowell’s house. Jordan Howard and Tarik Cohen. 28 carries. 170 yards. More than 6 yards per carry. Does Sunday night change the team’s approach moving through December? Roquan Smith continues to grow in the middle of this defense and he was the primary reason Todd Gurley looked so ordinary at Soldier Field. Let’s give a shout out to Sherrick McManis for his work filling in for Callahan. Cris Collinsworth seemed to think the Rams would exploit his having to play. They did not. He was steady. Minnesota plays in Seattle tonight. If they lose, the Bears will have a chance to win the NFC North next Sunday. At home. Against the Packers. Hoo. Boy.